On a gloomy & rainy spring afternoon a few weeks ago, I met a colleague for lunch in the city. She took me to Artisanal Fromagerie & Bistro, a charming place just around the corner from her office on Park Avenue. “Everything’s good here,” she said as the waitress handed us menus, “but I usually order the Cheese Board.” I quickly scanned the menu and, although there were lots of tempting choices, I decided to take Helene’s advice and ordered the Cheese Board. 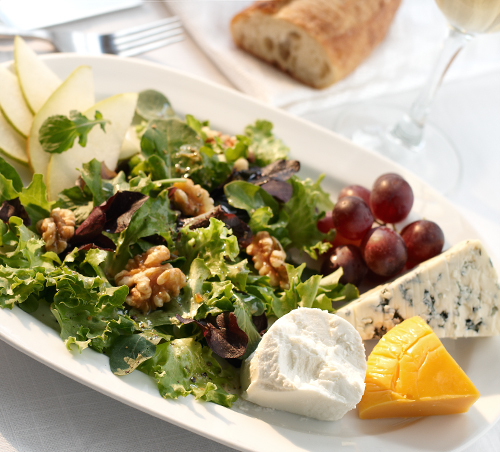 The waitress reappeared with a beautifully arranged plate featuring wedges of three different cheeses, a halved fresh fig, a cluster of red grapes, pear slices, walnut halves, and delicate spring greens. Did I mention we also had a basket of fresh baguette slices? Mmmm. A little bite of cheese, a nibble of pear, a crunch of walnut, perhaps another slice of bread….just a happy mix of flavors and textures. So very civilized! My day had brightened considerably by the end of this wonderful meal. Upon leaving, I requested the names of the three featured cheeses. They were Buche du Poitou (a French goat cheese), Coolea, and Cashel Blue (both Irish cow’s milk cheeses). Try this at home… a Cheese Board is so simple to make. Start by selecting a couple of interesting cheeses—perhaps a sheep’s milk, a cow’s milk and a goat’s milk. Allow one ounce of each cheese per serving. Arrange your Cheese Board with the cheeses, lightly dressed (just a touch of oil and vinegar) greens, nuts, fruit, and of course, fresh French bread. Bon Appetit! Note: the selection of cheeses in our photo are a Rosenborg Castello (Danish Blue), a Wisconsin Gouda, and a Chevre. Let us know which cheeses you use!